The time of change is the time for believing. In order to change our life and style, we need to believe that there is really something out there for us. Something that would inspire change in us. Quite admittedly, the past few years have been so difficult for me. But since I didn't stop believing in myself to surpass all the challenges that was thrown at me, I found out that change is not too intimidating and that it is something I really needed. The big change that happened in me didn't seem to so wonderful at first. I really thought I was being punished or something. It took me a long time to believe that that change was indeed for the better. We all undergo changes and oftentimes, we try to veer away from it. Maybe, this is the time to finally admit that change is good and that it's time that we start believing in something again. Let me make changing and believing a little more fun to you guys. 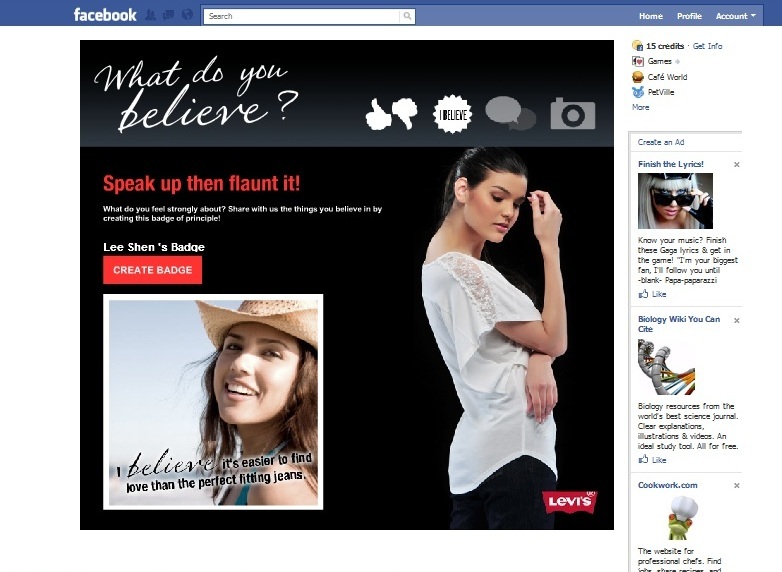 Levi's, the brand that changed how we see our jeans wants to know what we believe in. And if you're creative enough, you'll get a change to win a Php1,000.00 worth of gift certificate. 1. Think of something that you truly believe in. 3. Go to Levi's I Believe Facebook App ---> Click I Believe. 4. Upload your picture and type in what you believe in. 5. Share your I Believe Badge on your Facebook Wall. Attract your friends to join this contest and make their I Believe Badge. 6. Make this badge your Facebook Profile Pic for the duration of the contest. On the description of your profil pic, write "Please visit http://apps.facebook.com/ibelieve-badge/ to make your own Levi's I Believe bagde." 7. Comment here the link to your facebook page so we can keep track of your entry. 8. Please follow Shen's Addiction. The three winners will receive Php1,000 worth of Levi's GCs each. Winning entries will be featured on the Levi's GWI website once it's up and running. 1. Don't use photos of celebrities. 2. You may use photoshop or other photo editing tools to help with your creative process. Shen please count me in. I follow your blog and FB page. I believe each family is a legacy to the world. I hope I can treat myself to this Levi’s luxury. Love isn’t about gender. It is as the biblical passage says: love is kind, love is patient. GC for a cause, yay! Here is the direct link pala po.